Christmas has OFFICIALLY STARTED...it truly is the most wonderful time of the year! I went into the Brent Cross branch. To pick up some of my ole favourites and a few of the much hyped new products. The sugar plum fairy lip scrub, shares it scent with the Comforter scent family. It is made of caster sugar, orange oil and jojoba it is honestly so delicious. My lips have been suffering in this winter. but this scrub has helped loads. You just place some on your finger, rub it on your lips then lick off the rest. The sugar in it is what gives you the exfoliation. 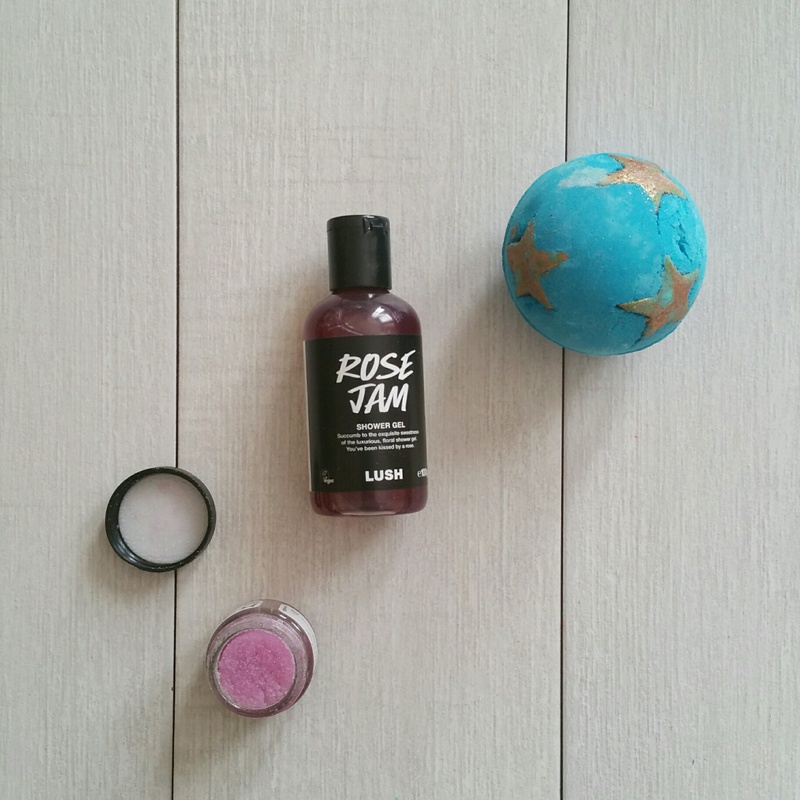 I'm not a fan of the Rose Jam bubbleroon, however I love the Rose Jam shower gel. Made with rose absolute, vanilla, Sicilian lemon oil and fresh goji berry juice. It's a rose scent, but it has a gentle sweetness to it and therefore not as floral smelling as the bubbleroon. The golden wonder bath bomb, is made with orange, lime and cognac oil. I like the fact that not like most of the bath bombs that it is a different shape and it is huge! and like every Lush present there is a surprise of the colour blue that pours out along with gold stars. Which leaves you with sparkly mermaid water. A new comer for the Christmas range is Never Mind the Ballistic. Is bath bomb and has a layer of pink cocoa butter sprayed on top of it. I'm a fan of bath melts as they really moisterise my skin. You need to have your bath quite hot to make sure the oil melts. It is made with lime oil, orange oil, frankinscence and fresh bananas. 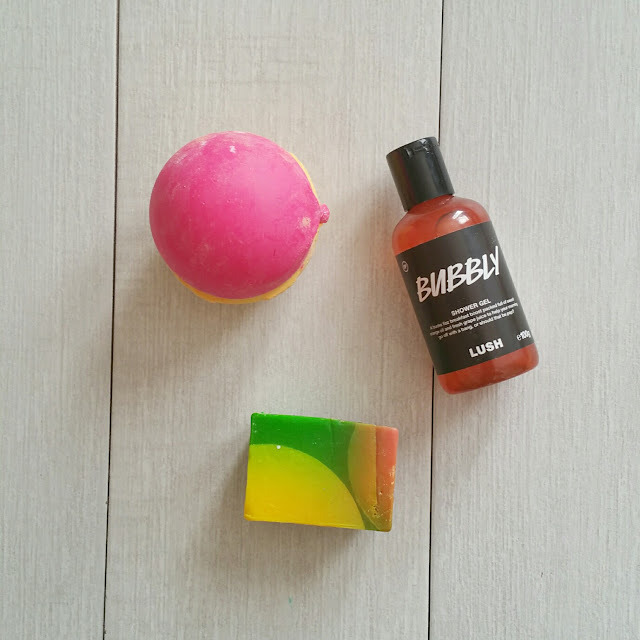 So if you love sweet fruity smells, you need to get yourself one of thesebefore they sell out!. Baked Alaska soap, is made with ylang ylang, grapefruit and lime oil. It's rather sharp and refreshing but not overpowering like a lot of citrus scent bath products. In the shop it is displayed as a huge globe shape, I love the colours. The only downside is It doesn't lather like a lot of the other soaps. Santa's belly shower jelly, it has the shape of Santa's belly. 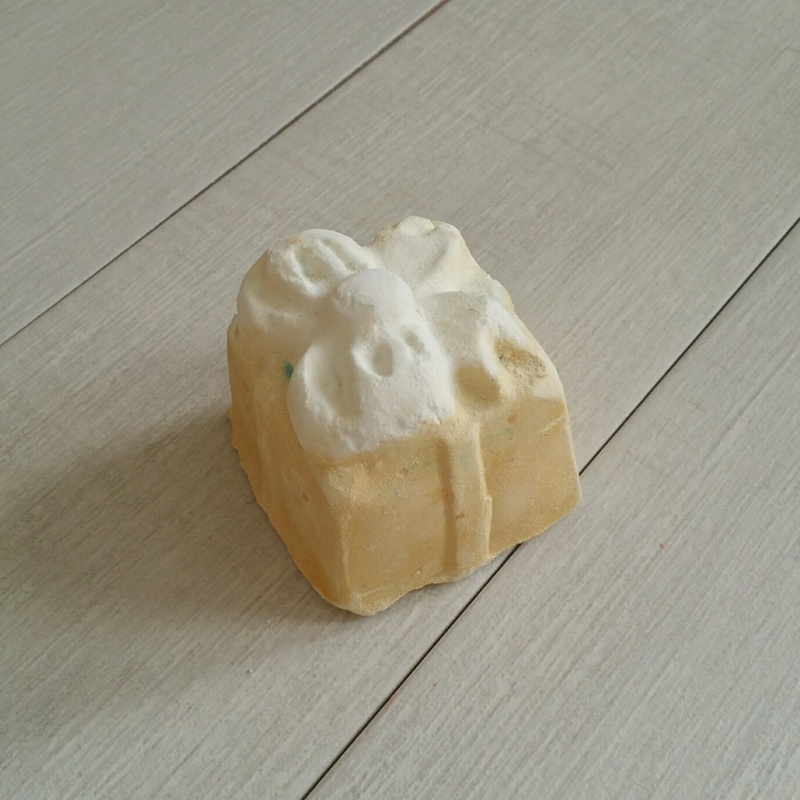 It shares its scent with the So White bath bomb.It smells like a fresh granny smith apple. It lathers really well and the scent stays on your skin for hours. It also has lots of gold stars and glitter. As it is a jelly, it is fun to wash with as it wobbles, this would make a perfect stocking filler for all ages. 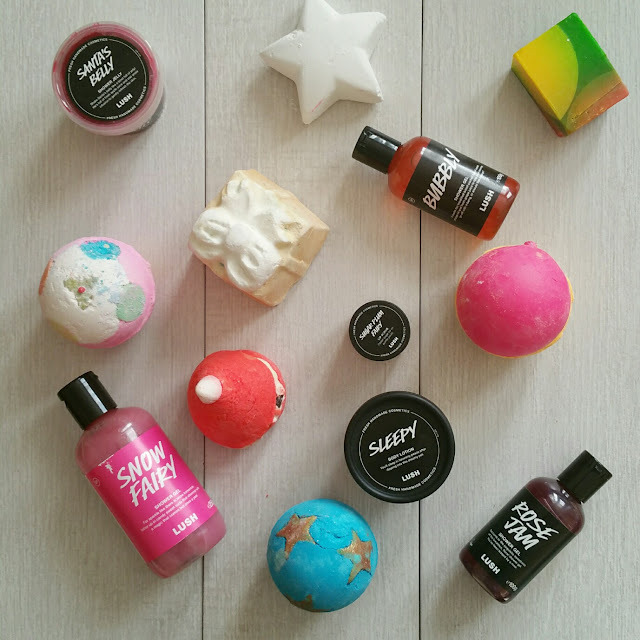 Peeping Santa bubble bar is one of my favourites out of the whole Christmas range. As you can see he is missing a eye, due to Darcy's curious hands. I got about 2 baths out of this cheeky little guy, however if I wanted a real bubbly bath I would just crumble the whole thing in. The smell of the Strawberry, vanillia scent is beautiful, and it turns your bath a lovely shade of red. Star dust bath bomb is another bath bomb that has had a makeover. Don't be fooled by it's plain outside. Inside there are lots of little stars, this is a very gentle sweet vanilla scent. Perfect when you just want a simple soak. 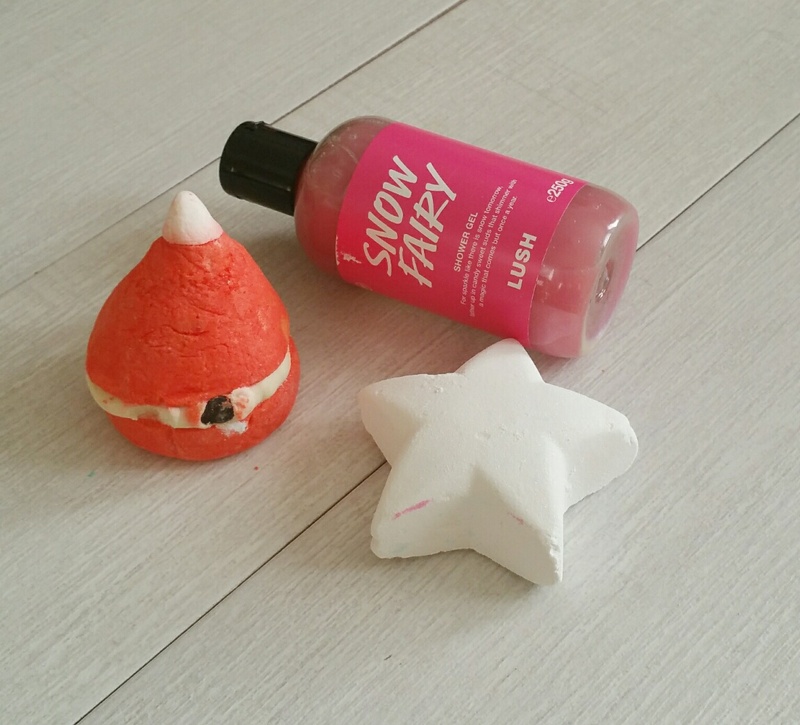 Snow fairy shower gel, was the first product that I ever brought from Lush. I was drawn by it's bright sparkly pink colour. Made with musk and vanilia, it is very sweet and creamy, the scent stays on your skin for a long time. Snow Fairy may not be for everyone due to the over sweetness, however I love it!!. 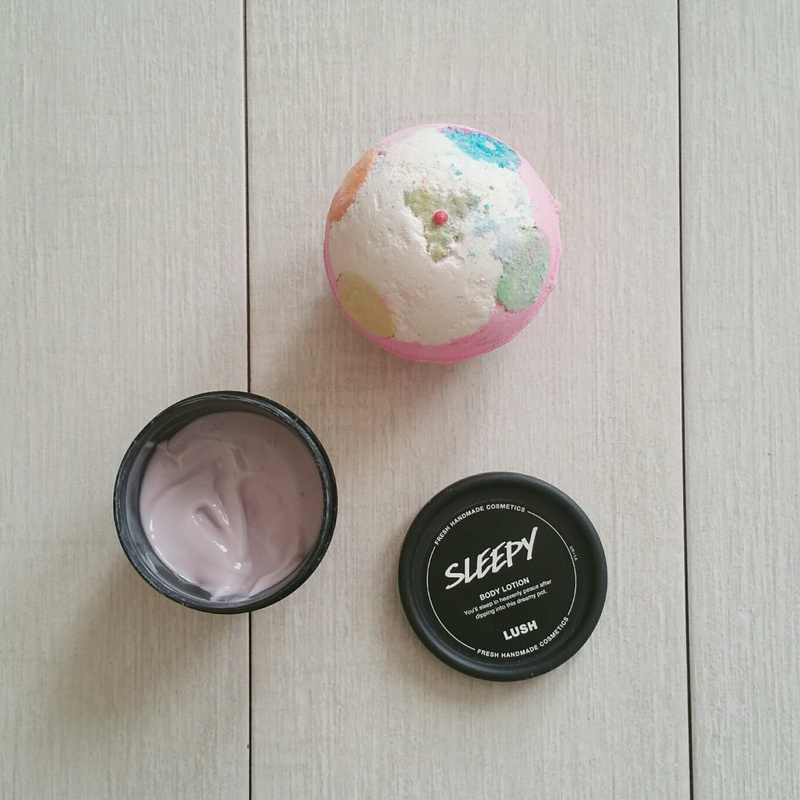 Sleepy body lotion is amazeballs!. It shares it scent with the Twilight scent family. I cannot get enough of it, as you can see I'm half way through my pot. I'm going to have to stock up before they sell out!! It doesn't smell very strong in the pot but when you rub it on damp skin and it warms up the scent comes alive. it's so nice and light on the skin and doesn't leave your skin feeling sticky like some body lotions. 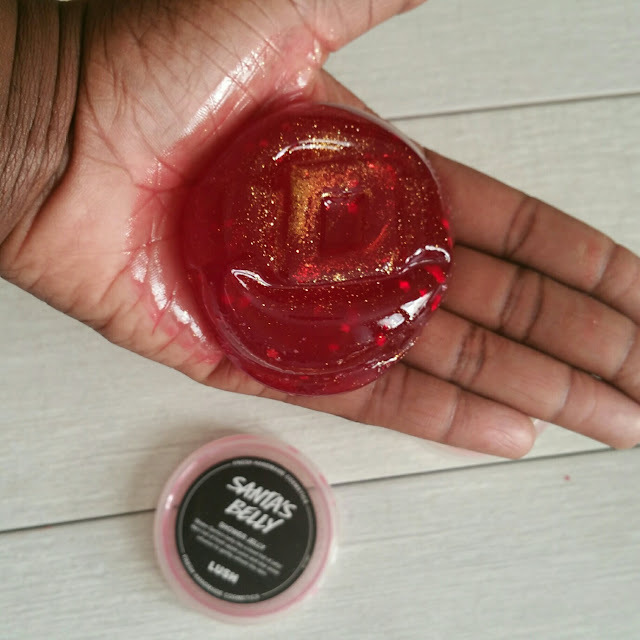 Luxury Lush pud is another product that shares their scent with Twilight. Made with Lavender, Tonka bean, and Ylang Ylang. It's just beautiful to watch in the bath, as the multi colours spill into the bath water. This Christmas Lush has also brought a dusting powder in the same scent called Mr Sandman and exclusively to Oxford Street you can buy the Twilight shower gel and now online through the Kitchen. 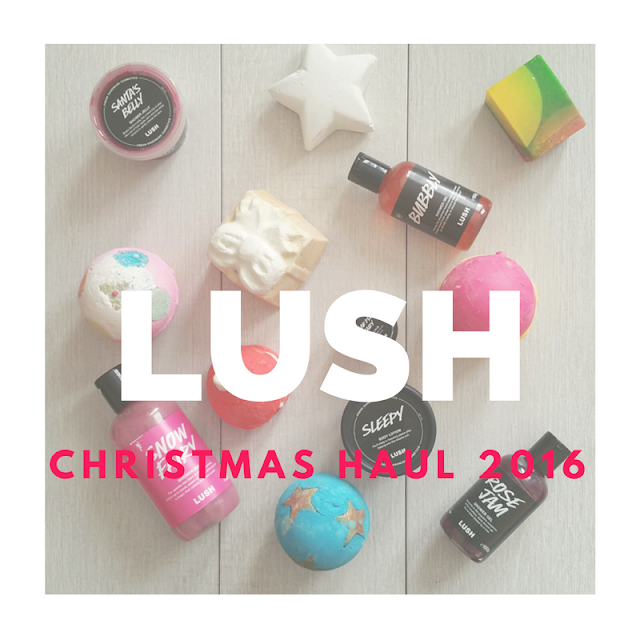 So that's ends my Lush Christmas haul, have you tried anything from the Christmas range yet?